Paul Crampton Contractors, Inc. began from a simple idea Paul, Sr. had back in 1967. He began a small home improvement company based on the foundation of exceeding customer satisfaction. Regardless the size of the job, Paul ensured he was involved in every phase of the project before, during and after the sale. The business quickly gained a reputation for outstanding service and value. In no time at all, the company grew to include new home construction—everything from land acquisition, to site work to the creation of some of Washington County’s most beautiful homes. In 1978 Paul Crampton, Jr. joined his father in the family business. Together they developed and built Towne Oak Village, a wildly popular two-story townhouse community featuring attached garages at incredibly attractive prices. Demand led to designing and creating a series of unique one-story townhomes, the first of their kind in Washington County. This style of home was ideal for active adults, “empty nesters”, widows and widowers as well as recent retirees. Father and son carried this concept into their next development, South Pointe located at the South end of Hagerstown. In 2007, Paul Crampton III followed in both his grandfather and father’s footsteps by joining the company as well. He is now responsible for sales, design and construction of our newest community, Emerald Pointe. The rich legacy of Paul Crampton Contractors continues, still based on Paul, Sr.’s vision of exceeding homebuyer’s expectations. 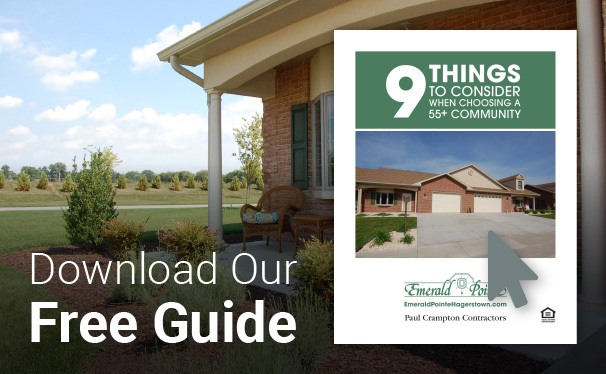 To learn more about Paul Crampton Contractors or Emerald Pointe, please call 301.573.0141.